I am one of those old-fashioned people who loves going by train. Give me a choice between a plane, bus, car or train, and I’ll take the choo-choo. And I blame that preference on the Trans-Karoo. Actually I’m not sure it was ever officially called the Trans-Karoo, but that’s how I came to know it. I used to travel cross-country as a schoolkid, Pretoria to Cape Town, and back, sometimes hopping off at a Karoo siding in the wee hours somewhere around De Aar, the closest stop to my aunt’s farm. I risked decapitation sticking my head out the window as we clickety-clacked through the neverending West Rand. I’d read my book stopping every now and then to let my eyes flit to the vast, arid sheep-dotted heartland rolling by outside. I’d eat that very distinctive mielie meal porridge laced with sugar scooped out of heavy silver containers marked with the South African Railways insignia. I’d wake up groggily at odd moments in the dark of night as we pulled into small towns you’d otherwise never get to. I’d anticipate that after snaking through the 13-kilometre tunnel near Touws River, a lush wonderland called the Hex River Valley awaited us. And then … Cape Town. I’d have soot covering me for days on end that I couldn’t wash off, when there were still steam engines. But that didn’t matter – the 24 hours on the Trans-Karoo was worth it. But then something happened. Planes multiplied and became cheaper. No one had time for a full 24 hours to get to where they were going, and if they did (and they could afford it) they took the Blue Train or Rovos Rail, and went in real luxury. The more egalitarian Trans-Karoo – with its starchy first class, mediocre second (on one trip, I recall, a couple sharing my compartment rifled through my bag and stole the more choice bits of my padkos) and subpar third class – seemed to vanish. The train was still there somewhere, I knew that, but it wasn’t clear in what guise or condition exactly. You no longer heard people say “Oh, I took the train to Cape Town/Johannesburg/PE”, but you did hear of many South African branch lines closing down. And I kept wondering whether the Trans-Karoo had been one of them. Well, happily, no. When South African Railways and Harbours was being renamed and split up – I’m not sure why exactly – into Prasa, Transnet, Metrorail and Shosholoza Meyl, the Trans-Karoo was placed under the last grouping. A number of years ago, I heard a rumour that Shosholoza Meyl was trying to reimagine the Trans-Karoo journey by adding a few upmarket coaches at the end of its cross-country express. For a fraction of the price of the Blue Train, it seemed, you could cross South Africa in almost-luxury. I kept wanting to do the trip, but always got – excuse the pun – sidetracked. It didn’t help that the Shosholoza Meyl website, whenever I looked at it, left me confused. The pictures were out of date, unlike other travel websites that oversell their product, promising glossy dreams but often providing a lot less in reality.To confuse matters more, the train itself (I still didn’t realise it was an entire train and not just a few added coaches) was called Premier Classe – French spelling I still don’t understand the reason for. All I found on the Internet was the odd unimpressive YouTube offering posted by a traveller who didn’t realise what gold they had come across. But finally, this June, I did it. I had my ticket for Premier Classe in hand. As I headed for the train in Johannesburg one Thursday morning, however, I still didn’t know what to expect – inside the train or outside – but, to be honest, it wasn’t much. I was excited – as I am for any train journey – but also in the dark. Not knowing any better, I bought myself some padkos and my own coffee, ensured I had enough chargers for my iPhone to last 24 hours, and made my way to Park Station. From the moment I arrived, though, I was met by one surprise – actually a better word to use would be “shock” – after the other. Even Park Station, which has been revamped since I was last there years earlier and was bustling with passengers, looked as good as anything you’ll see in Europe, even better. Following the instructions I’d been given, I headed for the “lounge”, not realising it was a dedicated lounge for the once-weekly train. I followed signs for Premier Classe and entered a space pretty much like you’d find for business- and first-class passengers at an airport, where you were met, signed in, were offered coffee, sandwiches and cake, and were then escorted down to the platform. The next surprise: The Premier Classe train is painted a very appealing light blue. In the few pictures I had managed to find online, the train was done in a shocking shade of purple, a choice of colour I’ve never actually understood, especially on the national carrier. I immediately came to think of it as The Light Blue Train or The Blue Train Light. Inside, the corridors were carpeted and clean, the compartment done in faux wood, the duvet (yes, duvet!) already neatly folded down, and Premier Classe shower gel and shampoo, terrycloth bath robe and slippers waiting on the shelves. Before the whistle blew everyone was invited for a glass of champagne in the lounge car. To say it was way better than I had expected is an understatement. Yes, I was truly shocked. Well, at 3pm the conductor blew his whistle, and we were off. The journey was much as I remembered it, at least to start with. Sticking my head out the window, watching the West Rand pass endlessly, marvelling at the mine dumps in the distance, the veld turning golden at sunset and then – almost impossible to believe – the breathtaking sunset, the wheels squeaking as we slowed for traffic ahead we couldn’t see, dining on kingklip and malva pudding over the pressed white table cloths, the dark night rolling by as I slept (although it’s always hard to get used to your first night on a train, moving however rhythmically – but I’m more than okay with that), and the – once again, almost impossible to believe – sunrise as we drifted into De Aar. Yes, it was one shock after the other. The thought that kept going through my head was this: Why is Premier Classe, the Light Blue Train, not being publicised? It is not often one stumbles on a travel secret, a destination or a journey few others know about, but Premier Classe certainly felt like one. For a smidgen more than R3,000, you were given all this luxury, more than 24 hours crossing spectacular countryside – and it truly is spectacular (See video at end for proof) – the staff ready to bring you a coffee or beer whenever you want. (I even had the electricity to charge my laptop and cell phone.) You could barely buy a first-class plane ticket for the same price, and for that you got a whole lot less. Yes, there is one but. The Light Blue Train is apparently almost always late. We arrived in De Aar at daybreak, when we were meant to be in Beaufort West already, several hours away. (In the end, in fact, we arrived in Cape Town four hours late.) One of my co-passengers, a German woman, had done the journey in reverse a few days earlier, and they had been forced to wait four hours outside Johannesburg, unmoving. When I asked Premier Classe about this afterwards, a spokesman said the delays were due to a combination of rail line maintenance by Transnet, power failures and a lot of things that a traveller probably doesn’t want to know about. As we moved off from De Aar station, I settled in once again. I indulged in one of the best breakfasts I’ve had in a long time, which included mealie meal porridge, and then got down to just lazing. I read my book, eyes drifting to the passing sheep and land occasionally. I chatted to the passengers – a mix of South Africans and foreigners. The Lemmens from Vanderbijlpark, who had been lucky enough to once travel on the very luxurious Eastern Oriental through Thailand and Malaysia, were on their way to Cape Town for a short trip, and instead of flying they caught the train. 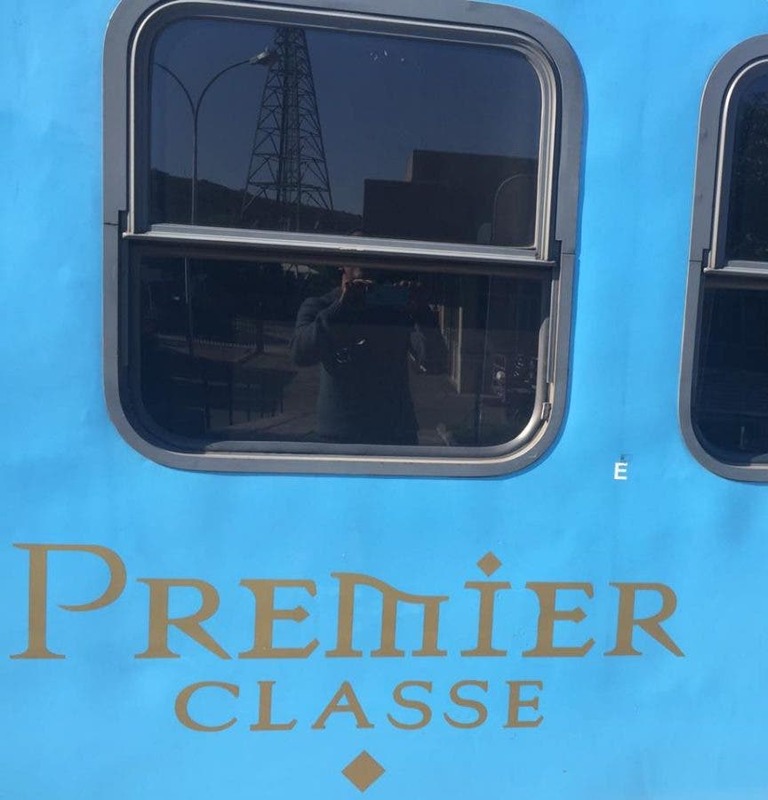 They were as shocked as I was to find the Light Blue Train hiding in plain sight from us all.They knew good train travel, and they said they would definitely take Premier Classe again. At Beaufort West we were allowed to get out and stretch our legs. Walking the lone platform on a Friday morning, I counted the coaches. Ten passenger coaches – about 12 people a coach, which, as anyone who’s caught trains knows, is spacious beyond belief – and two dining cars and two lounge cars. I climbed up the bridge over the track and took a look out across the top of the Light Blue Train, the only building piercing the skyline a lone white church. It brought back some great memories of travelling by train. And it struck me once again that this trip was just as I remembered the Trans-Karoo to be. The one big difference was that it’s a whole lot better.